Weeeee're back! We've returned from our family trip to beautiful Penticton in British Columbia, and we had a blast! We spent most of the day Friday soaking up the sun at Okanagan Lake in the newly fenced in and designated off-leash doggie beach with Oliver and Winston. Oliver was happy to be free to swim without the burden of his leash and really enjoyed fetching his floating orange chew toy. Winston was quick to chase after Ollie, even into the water, until he realized he could no longer touch the bottom. Though his rear end sank like a brick, his doggie instincts prompted him to paddle as fast as his little front legs could and he was an absolute riot. Once he got used to the idea of the ground disappearing from beneath him he would make short trips out into the lake after us, as long as we weren't too far. Once he reached us we'd pick him up (more like he'd climb up our legs) to give him a break before sending him between us or back to shore. He loved it! They both did. Towards the end of our swim you could tell Oliver was exhausted but he just couldn't resist the urge to swim out and back a few more times. You can see all of our exciting photos HERE! There are some really good ones :) AAAAND I put together a little video of our adventures that you can watch HERE. And what would an 8 hour drive between Penticton and Calgary be without something crafty?! We hit a Zellers in Penticton for a few items and they had some Bernat Soft/Boucle yarn skeins on sale for half off and I just couldn't resist. Especially since Lucas' grandmother had brought along her sweater project and had shown me her method of knitting. I realized that she knits continental style while I was taught and currently knit english style. It was interesting to see the difference and she seemed to fly through her project. After reading up on it, it seems most agree continental is faster. Thanks to the fine folks over at KnittingHelp.com (my knitting bible), I'm going to try and pick up continental knitting. I'd like to see if picking up continental will be easier or harder for me than being taught english style by Lucas' mom last summer. I really enjoy english style knitting, but it'd be nice to find which method is the fastest for me in the end. I have a few ambitious knitting projects on the horizon in time for the holidays this year planned already, and I'd like to find which way will help me get the projects done in the most efficient manner. Plus I hear if you're fluent in both methods, doing colour work via "stranding" is easier down the road, something else I'd like to learn. Anyway, I picked up two skeins of yarn -- one in Burgundy stripes and one in The Big Purple. 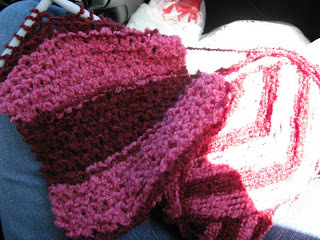 I started a scarf for myself from the burgundy skein on the ride home and if all goes well (which it is so far!) I'll make my mom a similar scarf from the purple skein since that's her favourite colour. 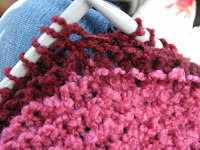 I'm using nice, big 10mm/US 15 needles and knitting loosely and I think casting on 20 stitches might be a bit too wide. I think for my mom's scarf I'll only cast on 15 stitches. 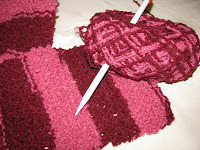 I'm not sure how long the finished scarf will be -- so far my burgundy one is at 50 inches and I just plan to go until I run out of yarn or until it seems to lay comfortably and suitably on me length-wise. I have a knitted scarf that I received from a student several years ago and it's beautiful, but it's 100 inches long and drags too much on short little me, so I plan to make the scarf long enough, but not too long... whatever that means ;) So I guess I'm shooting for a finished length of around 75 inches... in between where I am now and "too long." You have a great blog! Thank You for adding me to your fav blogs! I will be adding you to mine!